India's archaic and obsolete laws are seen by many as its most burdensome legacy. Among those which remain on the books are more than 300 dating from the colonial era, as well as rules to manage issues arising out of the Partition of India. There are more than a dozen laws imposing redundant taxes that yield little and cost a lot to collect, as well as outdated laws relating to former princely states and the nationalisation of industries and banks. Prime Minister Narendra Modi says one of his missions is to rid India of a "maze of useless laws". During the election campaign he promised that for every law passed, his government would repeal 10 obsolete ones. More recently, in a speech at New York's Madison Square Garden, he said he planned to get rid of one such law every day. His government has already placed a bill in parliament, recommending 36 obsolete laws be revised. A Delhi-based citizens' group has gone a step further and compiled a list of 100 laws to delete from the statue books. The law defines treasure specifically as "anything of any value hidden in the soil" and worth as little as 10 rupees (16 cents; 10 pence). The finder of such treasure, according to the law, will need to inform the most senior local official of the "nature and amount or approximate value of such treasure and the place where it was found". Also, if the finder fails to hand over the booty to the government, the "share of such treasure ... shall vest in Her Majesty". It's worth remembering that the British left India in 1947. Walter James McDonald Redwood, a priest in the southern city of Bangalore, solemnised many local marriages during his time, mistakenly believing that he was authorised to do so. The law was introduced to validate those marriages. It's less clear what relevance it has these days. The law levies a cess - a tax imposed for special administrative expenses - on salt manufacturers at the rate of 14 paise (2 cents) per 40kg on all salt made in a private or state-owned salt factory. The proceeds - after deducting the cost of collection - are used to meet expenses of salt-making, labour welfare and research. In 2013-14 collections from the tax amounted to $538,000 (£343,400), which was nearly half the cost of collecting it. Given that collections are so low, says the Delhi-based Centre for Civil Society, removing this act - and tax - would have little effect on the government's finances. A High Level Salt Enquiry Committee set up in 1978 recommended that the tax should be scrapped since the "annual collection was very small" while the total cost of collecting it was more than half of the total collection. The recommendation is still pending. Although 92% of salt in India is produced by private companies, its salt industry is controlled by what is called the Indian Salt Service, employing some 800 officers. 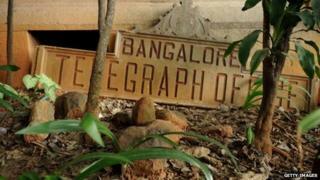 The law regulates possession of telegraph wires by Indians. A person who possesses telegraph wires - with precisely defined diameters - is expected to inform authorities about the quantity in his possession. Anybody possessing more than 10lb (4kg) of such wire has to convert the excess into ingots. The problem with this law is India sent out its last telegram in July 2013, after which telegraph services were shut. The law says only the federal government has the "exclusive privilege of conveying by post, from one place to another", most letters. There are a few exceptions, including one particularly bizarre one: "Letters sent by a private friend in his way, journey or travel, to be delivered by him to the person to whom they are directed, without hire, reward or other profit or advantages for receiving, carrying or delivering them". India's thriving courier industry circumvents this law by sending "documents" rather than letters. The 145-year-old law deals with regulating public sarais (rest houses), including duties of the manager and "removal of noxious vegetation" on the site. The law says sarais should also provide free drinking water to passers by - reports say it is often misused instead to harass hotel owners. The law was enforced to "prevent the dissemination of certain publications harmful to young persons". A harmful publication is one that "tends to corrupt a young person" with pictures and stories which depict "violence or cruelty" or "incidents of a repulsive or horrible nature". Many believe that words such as repulsive and horrible are "vague and subject to arbitrary interpretation, and consequently lead to widespread discretion and serve as an excuse for harassment". For example, earlier this year, police in southern Kerala state raided shops selling Bob Marley T-shirts on the grounds that these encouraged youngsters to consume drugs - and shopkeepers were charged under the law. The law defines an aircraft as "any machine which can derive support in the atmosphere from reactions of the air". So it includes "balloons, whether fixed or free, airships, kites, gliders and flying machines". It also says only the government can make rules regarding "possession, use, operation, sale, import or export of any aircraft or class of aircraft". By this logic, it would be illegal to fly kites and balloons without government clearance in India. This law requires every foreigner staying in India for more than 180 days to report his/her entry, movement from one place to another and departure, to the authorities. Introduced by the British to regulate the entry and movement of foreigners in India - particularly of Indian revolutionaries from abroad - the law also requires owners and managers of hotels and boarding houses, and aircraft or ships to report the presence of any foreigners. Many say the law has become a tool to harass foreigners and is an impediment to India's efforts to boost tourism. This discriminatory colonial law exempted areas populated by India's Sonthal tribespeople from general laws and regulations because they were an "uncivilised race". The law, introduced to curb uprisings by isolating tribal populations, "violate the principles of equality under law adopted by our Constitution and give legitimacy to discrimination and ill-treatment of tribal populations in India", according to a citizens' group.